Join us to celebrate our sisterhood and founders at our annual Founder's Day Celebration and Silent Auction. We are excited to announce that we will be having a menu that has been hand selected by the executive chef of The Lumen, as well as a Mimosa Bar for those 21 and older! Please RSVP (completing all required sections) and make your payment below (note that valet service will be $5 if you wish to use it). Questions? 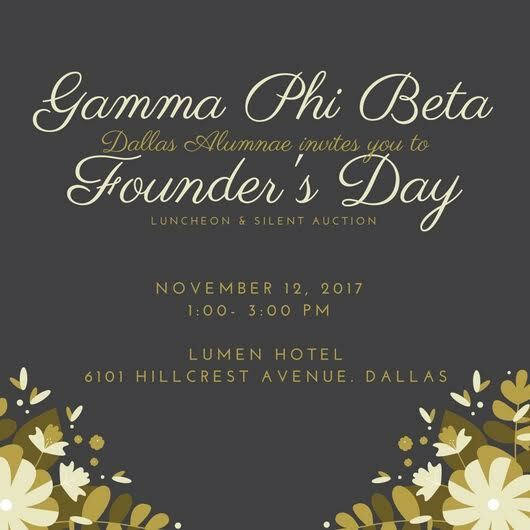 Contact Ren Morrison at ren@gammaphidallas.com or Brittany Alexander at 214-906-0825 for more information. If you have any information about donations towards the Silent Auction please contact us HERE.